There are so many things that I've never grown before this year that it feels like most of the vegetable garden has been an experimental plot this summer. Some of the more exotic things (to me, anyway) are now catching up with everything else. The 'Ping Tung' eggplants/aubergines that looked so tiny and pathetic when I put them out in early June have caught up enough to put out some little purple fruit. They are supposed to grow to 18 inches long. They're in the same bed as the drowned tomato plants, so it's a bit of a miracle that they're still alive, let alone fruiting. 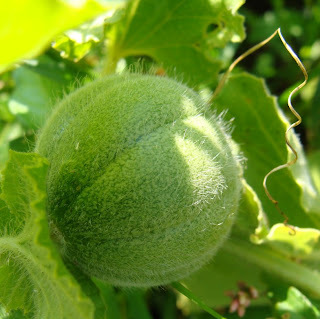 Some melons are beginning to form, too - 'Golden Jenny' and 'Tigger'. They're only tennis-ball-sized at the moment, but I'm hoping they'll put on a spurt of growth, too, in the next few weeks. Oh I hope they mature for you. 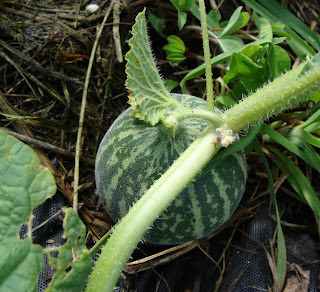 I've tried to grow melons with very marginal success, but not this year. I have a garden much like you in some ways. 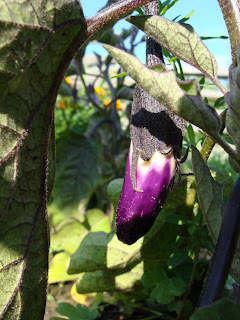 I'm growing lots of things I've never grown before (including eggplant). It is fun to see what works and what doesn't. And probably most humorous to see the look on my face when I tasted arugula for the first time. I absolutely hated it. Yuck. But it only cost me a dollar to try it in the garden. It would have cost a lot more from the supermarket. Hi Daphne - I've been keeping an eye on your eggplant recipes in the hope that I'll be able to try them soon. By the way, I made your refrigerator pickles and they've been great, so thanks for that recipe, too!